It has been another eventful year of athletics, with jaw dropping performances, some shock results, along with a touch of controversy. James Sullivan takes us through Part 1 of his A-Z of the 2011 athletics year. One of track and field’s finest ambassadors, Allyson Felix, had another eventful season as she continued her pursuit of double glory in 2011. Having claimed the Diamond League title over both 200 metres and 400 metres in 2010, the American targeted both events at this year’s World Championships in Daegu. The three time world champion, and twice Olympic silver medallist over 200 metres, performed admirably in her debut championship over the longer event, taking the silver medal in one of the races of the championships. Felix set a new personal best of 49.59 seconds in the process, and was just edged out of gold by Botswana’s Amantle Montsho, who got the better of the diminutive American by just 0.03 seconds. Over 200m, she was aiming for a fourth consecutive world title. However she had to settle for the bronze medal and was visibly disappointed afterwards. The jury is still very much out with regards the sense of taking on such a challenging double, especially with the 200 metres, her stronger event, taking place after the 400 metres. It remains to be seen whether Felix will continue her double attempt in London next year, or instead focus solely on taking Olympic gold in the 200 metres, the one major title to elude the 26 year old. 2011 saw the passing of two very high profile names. Norway’s Grete Waitz lost her battle with cancer, aged just 57. Waitz was a pioneer for women’s marathon running and single-handedly brought media recognition to the event, which ultimately led to its admission into the Olympic programme in 1984. She won the New York City Marathon on a record 9 occasions during the 1970’s and 1980’s, the London Marathon twice, the gold medal at the inaugural World Championships in Helsinki in 1983, along with the silver medal the following year at the Los Angeles Olympic Games. Between 1978 and 1983 she brought the women’s marathon record down by an astonishing 9 minutes, from 2:34:47 to 2:25:29. The other tragic story of 2011 related to the Kenyan athlete Sammy Wanjiru. The Olympic Marathon Champion from Beijing died from a fall from his balcony at his home in Kenya, suspected to be a suicide, sending shock waves around the athletics world. After winning the gold in Beijing in an Olympic record time, he went on to record victories at the 2009 London Marathon and the 2009 and 2010 Chicago Marathon. With a PB of 2:05:10, and at just 24 years of age, Wanjiru was tipped by many as a future world record holder. His ultimate potential will sadly never be known. 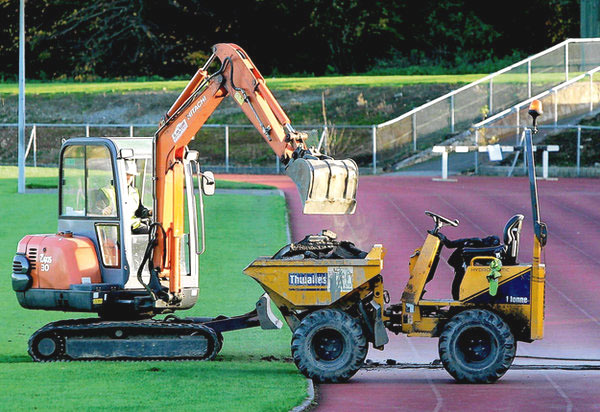 The historic Belfield athletics track at University College Dublin (UCD) was executed in the cruellest manner possible in November. An announcement was made to all students of the University that the track was to close due to health and safety reasons. Within 21 hours of this statement diggers were out in force, engraving two large trenches into the hallowed surface, rendering it completely useless to the many people who availed of the facility. The UCD Athletics Club was never consulted about the supposed health and safety issues, and no notice was given to the club that their training facility would be closed, leading to public outrage, and an assumption among many that there were more cynical and financial reasons for closing the track. In 1985, Belfield was the setting for the world record over the 4×1 Mile relay, when an Irish team made up of Eamonn Coghlan, Marcus O’Sullivan, Frank O’Mara and Ray Flynn set a standard that has not been bettered since. Numerous top athletes such as Sonia O’Sullivan and John Treacy have competed on the track, and perhaps most tragically of all, Ireland’s current middle-distance sensation, Ciara Mageean, turned down dozens of scholarship offers from NCAA universities in the USA in order to study and train in UCD. Now the most successful junior athlete in Ireland’s history is without a campus based track to train on. It is more facilities that the country needs, not less! Usain Bolt is rarely far from the headlines, and 2011 was no different in this regard. However, unlike the 2009 World Championships, when he set stunning world records over both 100 and 200 metres, at the Daegu edition many of the column inches were very much for the wrong reasons. While he had an average season by his very high standards, he was still the overwhelming favourite as he lined up for the 100 metres final. However, as has been widely publicised by now, Bolt made an absolute hames of the start, recording a negative reaction time. Under the current rules an athlete is disqualified if he/she false starts once. No second chances. The entire stadium literally gasped at once when the red card was shown to the showman from Jamaica, and there were even a few spectators who exited the stadium before the race took place. There has since been too much talk about the false start rule, and the fact that the IAAF are even considering changing it, shows nothing but pure disrespect to every other sprinter in the competition. Just because the most famous athlete in the world was unable to control himself for a few split seconds does not justify modifying the rules. There have been lots of sprinters who have false started in major competitions before Bolt, and not an eyelid was batted. The rules are the same for everybody, no matter how fast or slow, popular or unknown somebody is. And a little bit of detective work, straight from the horses mouth. Speaking before the 2009 World Championships in Berlin, Bolt said: “For me, I have no problem, I never false-started yet. It will be better for the sport. It will be a problem for some people but not for me.” Case Closed! Paris was the setting for the 31st European Indoor Championships, which took place between the 4th and 6th of March. In total, a record 630 athletes competed, representing 46 nations. 21 countries made it on to the medals table, which was topped by Russia, who claimed 6 gold, 3 silver and 6 bronze. It was the French athletes who provided the major highlights of the championships however. Teddy Tamgho set a new world indoor record of 17.92 metres en route to gold in the triple jump, while Renaud Lavillenie leaped a sensational 6.03 metres to take the pole vault title. From an Irish perspective, the best performer was Derval O’Rourke, who finished in a highly credible, if not slightly disappointing, 4th place in the women’s 60 metres hurdles in a seasons best of 7.96 seconds, a race won by Germany’s Carolin Nytra in a blistering time of 7.80 seconds. One of 2011’s outstanding performers was Great Britain’s Mo Farah. The Somalian born athlete made huge strides forward this season, having moved to Oregon, USA, to be trained by legendary coach Alberto Salazar. He began the year by taking the gold medal at the European Indoor Championships in Paris, and followed it up with a European record of 26:46.57 over 10000m at the Prefontaine Classic at Eugene, Oregon in July. A few weeks later, at the Diamond League meet in Monaco, he set a new British record over 5000m, with a world class clocking of 12:53.11. He entered the 10000m final in Daegu as the overwhelming favourite, but was on the end of a stunning upset by unheralded Ethiopian Ibrahim Jeilan, and had to settle for the silver medal. Unperturbed, he came back less than a week later to take the gold medal in the 5000m, defeating Bernard Lagat into second place. A showdown in London between Farah and a fully fit Kenenisa Bekele is perhaps the most mouth-watering potential match-up next year. European sprinting came of age at this year’s World Championships with many of the continent’s best at the forefront of events traditionally dominated by the USA and the Caribbean nations. The most significant result was David (Dai) Greene’s gold medal for Great Britain in the 400m Hurdles. The 25 year old Welsh athlete defeated all around him, including illustrious US rivals Bershawn Jackson and Angelo Taylor, Javier Culson of Cuba and world leader Ly Van Zyl of South Africa to take the title in a time of 48.26 seconds. He now holds European, Commonwealth and World titles over the event, and will next year aim to emulate his fellow Brit, the great Sally Gunnell, who held all four major outdoor titles (Olympic, World, European, Commonwealth) simultaneously, also in the 400m Hurdles. There was also major European success in Daegu in the form of Christophe Lemaitre and Kevin Borlee. Lemaitre, who in 2010, became the first Caucasian to run sub 10 seconds for 100m, progressed even further this year, winning the World Championship bronze medal over 200m in a sensational clocking of 19.80 seconds, just days after frustratingly being edged out of the medals in 4th place over 100 metres. Over the shorter event, he has continued to slowly bring down his French national record, which now stands at 9.92 seconds. At just 21 years of age, it is frightening to think what this man is capable of achieving over the coming decade. Borlee, likewise, achieved the bronze medal in Daegu, over 400 metres, and is now regularly running sub 45 seconds, clocking a personal best of 44.74 this year, just 0.03 off his twin brother Jonathan’s Belgian record. Incidentally, Jonathon finished an impressive 5th in Daegu. The men’s 110 metres hurdles final proved to be one of the most eventful races in Daegu. The event was billed as a showdown between the three fastest sprint hurdlers of all time; world record holder and 2008 Olympic Champion Dayron Robles of Cuba, 2004 Olympic champion Liu Xiang of China, and world leader David Oliver of the USA. However the script was thrown out the window as Jason Richardson of the USA took a surprising gold medal, nothwithstanding a world class PB of 13.08 seconds, set just weeks before the World Championships. This victory was not achieved without a touch of controversy however. 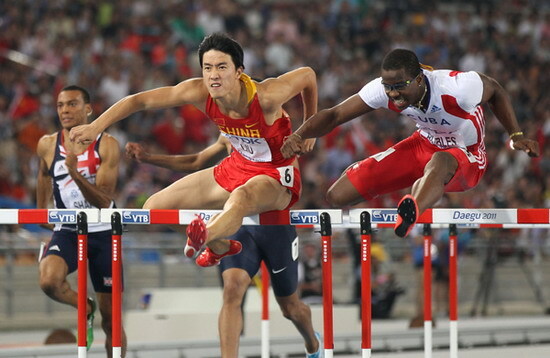 In the closing stages of the race it looked inevitable that Liu Xiang would take the gold medal, only to be impeded by Dayron Robles who was in the lane beside him, causing the unfortunate Chinese athlete to clatter the final hurdle, costing him a likely victory. Robles crossed the finish line first, with Richardson second and Xiang third. After the race the Chinese team made an official protest, and within an hour the Cuban world record holder was disqualified, giving Richardson the gold, Xiang the silver, and Britain’s Andy Turner the bronze. While the American ran a strong race, there is no doubting that the best athlete did not win the gold medal. The disqualification of Robles doesn’t bring back the almost certain gold medal that Xiang would have claimed. For the record, David Oliver could not carry his 2010 and 2011 Diamond League form into Daegu and finished in a very disappointing fourth place. This was the first part of James’ review of 2011. Click here for Part 2 and here for Part 3.